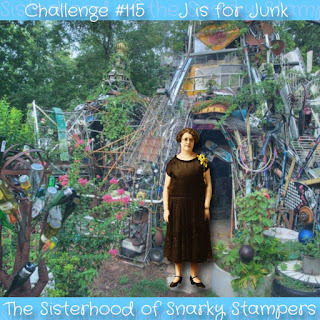 Our new theme at The Sisterhood of Snarky Stampers is Junk. In other words, we'd like to see something upcycled/recycled on your work …. or indeed, your work on something upcycled/recycled. I've taken the latter route, using a paper carrier bag I was given instead of a plastic one in a shop recently. I masked off the bag to leave a large square in the middle and stamped it randomly with a starburst pattern, first with a white Brilliance pad, then a gold Delicata pad and finally with a glue-stamping pad, and sprinkled ultra fine green glitter on the gluey bits. Then I sponged ink around the edges of the square, removed the masking and tidied up the edges by ruling a fine line around the edge using a deckle-edged ruler. I added the sentiment using self-adhesive letters - over the glittery parts they needed a bit of help from some stronger glue. I believe that not everyone uses the expression "old bag" to describe a miserable or grumpy old woman, but we do here in the UK, so there's a nicely snarky double meaning to this, as it could refer to the person carrying it or merely to the fact it is a bag that's old. Now how about getting your protect-the-planet hat on and recycling something with us over at the Sisterhood? Who knows, you might become Queen or Princess of Snark! I love the double entendre you've used on this masterpiece! This is the best bag!! What a fun altered bag! I actually spit out my coffee when I saw this. Hysterical! Hi, Jane! Just discovered the soss blog, so I'm exploring. Fantastic re-design on your old bag! Love it!! I love when I'm given a paper bag so I can make something crafty out of it! This is especially snarky-fine!